When he’s not cooking, Pulsinelli moonlights as a rapper and skateboarder. Hence, the name (after his rapper alter ego) and theme of his 90’s hip hop and skateboard inspired restaurant. That being said, the space and the chef himself look nothing like what you would expect. Pulsinelli looks less like Eminem and more like Daddy Warbucks, if Daddy Warbucks were the type of guy to attend the school’s fathers’ club meetings. And, the restaurant’s interior looks more like The Max for elder millennials, complete with Edison Bulbs, foliage, and repurposed furniture. This intermingling of ideas work, though. The touches are there to satisfy the chef’s 90’s dreams, but subtle enough so it’s not offensive. It’s safe to say that the concept is not like anything else offered in New Orleans. The interior, which for so long looked like a generic chain restaurant, has been completely renovated to look brighter, more fun, and inviting. 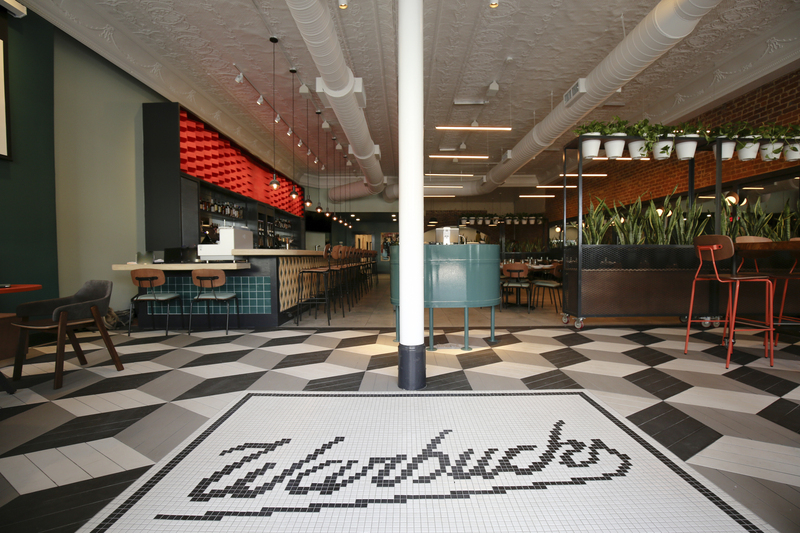 The vibrant tiles along the side of the bar and tiled floor at the restaurants’ entrance are reminiscent of classic diners, and the edge of the bar has cracked wood in the design to resemble stacked skateboard decks to pay homage to the skateboard culture. 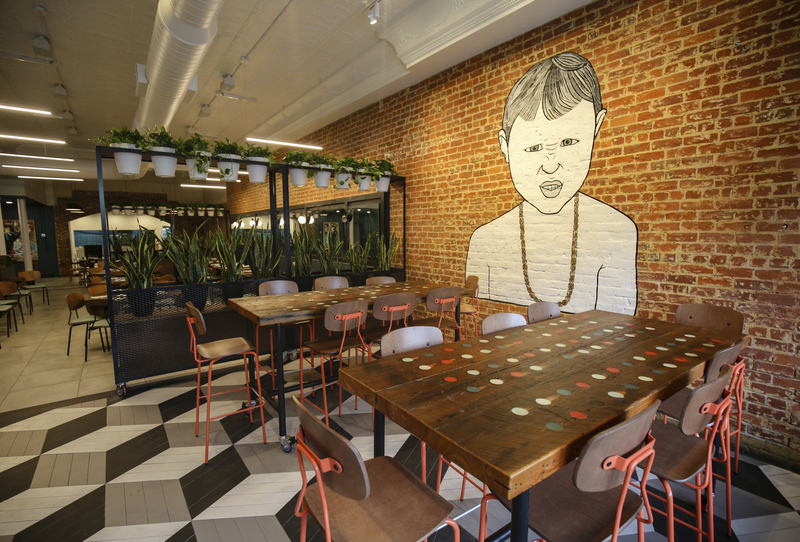 At the entrance, there are two communal tables along an exposed brick wall with a large mural of the couples’ six-year-old son wearing a gold chain. The chain is made of interconnecting pointy “cool S” doodles that only those who were in middle school during the 90’s would recognize. The mural is a reminder that they don’t take themselves too seriously there, but, also, that this is about family. For the food offerings, Pulsinelli wanted to use his training and experience in fine dining, yet still keep the menu approachable and full of the things he likes to prepare and eat. For example, a waygu beef hot dog made in-house, served with coleslaw and house-made chips. Ok, maybe not the most novel item, but neither was the “That Burger” – two beef patties, American cheese, fully dressed on a poppy seed bun. However, “This Burger” – two beef patties, swiss cheese, pickled red onion, red wine foie gras butter, between a poppy seed bun – should have been named the (all) that burger, because it definitely showcases the more elevated and unique side of the restaurant. Another stand-out item includes the “Lacquered Pork Belly” – pork belly lettuce wraps topped with house pickles and serrano peppers. It is smoky and spicy, and surprisingly not overwhelming with the different flavors. The “Warbucks Mac and Cheese” is never a bad idea, especially since it’s sprinkled with crunchy bits of pork. The Corndog “Elote” is a traditional corndog dressed as a Mexican corn on the cob. It’s rolled in hominy before getting dunked in the fryer, giving it a crunch factor, and served with lime crema, as any proper elote would. The Smoked Octopus Red Beans would otherwise be considered blasphemy by any New Orleanian, but the smoky flavor of the thinly sliced octopus was an appropriate substitute for sausage and made for a pleasantly delicious take on the staple. And, there’s always Chef’s favorite – the Shrimp Rings – ground shrimp molded and fried to look like onion rings, served alongside a unique cocktail sauce topped with fingerlime, which adds some texture and zest to the familiar flavor. His concept, Pulsinelli says, took years to perfect, and he even had his designers at Farouki Farouki create a special mold so they could be mass produced in the kitchen. While Pulsinelli works on making comfort food great again, he and his wife are aware that not everyone may be as daring when it comes to experimenting with food, specifically kids, so they are happy to modify their items to accommodate any picky eaters or children. The corndog elote can be served like a regular corndog and the burger can be prepared like the reliable standard, if that’s what the customer prefers. The cocktails are just as fun as the décor and music. The Warhead, true to its name, tastes just like the candy – only with alcohol. It’s a frozen drink made with cathead honeysuckle vodka, lime, bitters, and topped with a powdered nostalgia they call “magic dust” – basically a concoction of kool-aid, sugar and citric acid. The frozen negroni is a new take on the classic Italian cocktail, joining the frozen drink trend in the restaurant industry. It is an acquired taste and pleasantly bitter, as negronis tend to be, but it balances out the more flavorful, sour Warhead on the menu. To me, a negorni tastes and feels much like eating a grapefruit – not everyone likes the taste, but the benefits of eating one to help with weight loss outweighs the flavor. Except, instead of making you skinner, a negorni will just make you tipsier. This should be a hit during the summer. Other cocktails include the Cereal Killa’ – think milk punch with cereal milk – and the Liquid Sword, a mezcal cocktail rimmed with lime and cayenne pepper. The spice from the glass neutralizes the smoky mezcal taste and will definitely appeal to the spicy margarita aficionados in New Orleans. The Basic AF is fundamentally every basic girl’s drink of choice – vodka, lemon and soda with some St. Germain to make you feel fancy AF. It is refreshing like lemonade, and added bonus: those who aren’t pumpkin spice carrying members of the basics can order this drink ironically, and enjoy it undercover at Warbucks. They won’t tell. As much as the owners make it clear that they don’t take themselves too seriously, one aspect they do take seriously is how they run their business. Pulsinelli has tried to distance himself from the Besh scandal that broke late last year, while he was leading the kitchen at August, by staying focused and making sure that he continued to run his establishments properly. Now with Warbucks, the owners follow the same protocols that were established for all BRG restaurants – they now work with an external firm to interview employees and make sure there are no unresolved problems; have instituted an anonymous hotline for employees to share concerns; redefined the employee handbook, which includes a new code of conduct and morality clause; and launched a HIPAA-protected employee assistance program to help employees deal with work-life balance. “BRG as a whole is striving to set the new industry norm on how to operate kitchens and restaurants that are safe and respectful, and that includes Warbucks,” adds Pulsinelli. Now, more than ever, BRG restaurants and their work culture are under a microscope, so the pressure is on for Warbucks, as the first restaurant to open under the hospitality group since last year’s scandal and rebrand. But, then again, this is only a reminder that all restaurants should feel this kind of pressure. 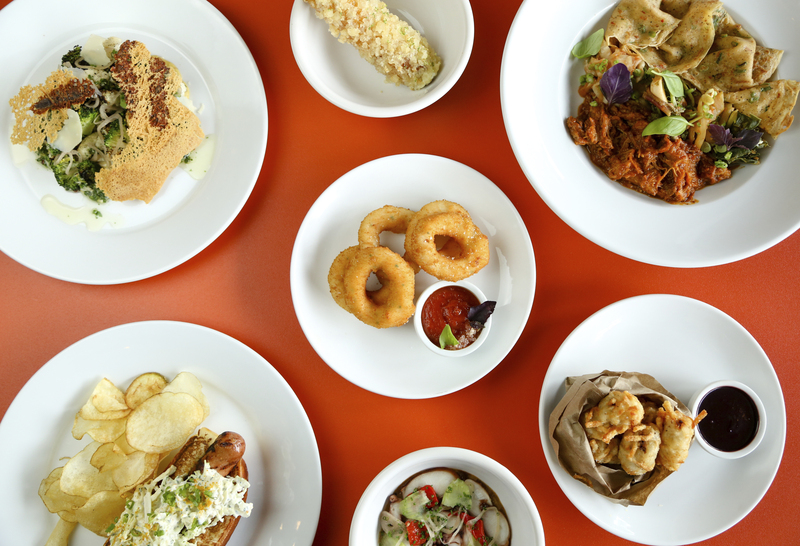 Warbucks brings several new concepts the New Orleans restaurant landscape – from the work culture to the food offerings and, specifically, the 90’s skateboarder theme. For the Ohio native, it was all about bringing his passions together – food, family, skateboarding and rap. But, it also brings a deeper meaning that we can all understand: that it’s a place for nostalgia and friends. For all those reasons, the newest addition on Magazine Street is definitely worth a try.